The Graduation Day for IB and A level students of Dr. Pillai Global Academy was organised on 18th August, 2017 in the school auditorium. The event began with the lighting of the lamp followed by a graduation message by the Principal, Ms. Anjna Sahi. In her advice to the students Ms. Anjna pointed out that as they venture out into the vast and unknown experiences of college life, they should learn to handle their freedom with wisdom. It was a proud moment for the teachers and parents who witnessed the students being awarded the graduation certificates. The teachers spoke about their experiences with the students and wished them luck in all their future initiatives. The students expressed their gratitude to all the teachers and the management for having supported and guided them throughout their school life. The event concluded with a vote of thanks proposed by the Vice Principal, Ms. Shraddha Sardesai. The class of 2015, at DPGA dreamt of seeing themselves adorning their graduation robes, with their diplomas, and this is what exactly happened in the graduation ceremony, held on 15th August 2015. The event was presided over by Dr. (Ms.) Celina Joy, CFO, MES Group of Institutions. The programme commenced with the traditional lighting of the lamp, followed by the award of graduation certificates and certificates of academic and co-curricular excellence by the chief guest. Dr. Celina Joy addressed the graduates with her wonderful words of wisdom, on carrying life forward with long confident strides and making right decisions, without forgetting the roots of their learning. She also urged students to become responsible human beings. The day proceeded with thanks – giving session by students, where they thanked their teachers and parents, for standing by them through their thick and thin. This was followed by teachers, reliving their experiences with students, while they were at school. Teachers made the student life more cherishable, by conferring them with apt “Fun titles”. Every member of the audience had a tear filled eye, when they were taken down the memory lane, with a movie made by Ms. Vandana Puri. The graduates were then invited into the alumni association of DPGA. The event was declared closed, with a photography session by Ms. Deepica Sharma and a vote of thanks, proposed by the IBDP Coordinator, Ms. Shan Liz Sanju. The DPGA family extolled the success of its students on 16th August, 2014 by conducting the Graduation Ceremony. The evening was special as the school felicitated the students on their brilliant performance in the IB and A Level examinations and making the school proud by shining as national and world toppers. The air in the auditorium filled with a sense of pride and delight as it was announced that four of the students secured admission in the best of the universities in the world: Aditya Rajagopal in Imperial College, London; Chinmay Thakare in University of Illinois, Urbana-Champaign; Shubhankar Patankar in University of California, Davis; Namit Verma in Manipal Institute of Technology and Aishwariya Shridhar in Pillai’s College of Arts, Commerce & Science (Bachelor of Mass Media). The Chief Guest for the event was Dr. Sally Enos, an accomplished personality in the field of education, currently heading the Pillai College of Education, New Panvel. The programme began on a solemn note with a prayer song and the lighting of the lamp by the Chief Guest Dr. Sally Enos, Principal Ms. Anjna Sahi and coordinator Ms. Shraddha Sardesai. A tuneful welcome song followed the welcome message by Ms. Shraddha Sardesai. The proud moment came when the students made a grand entry on the stage in the graduation robes and caps. The Principal, Anjna Sahi delivered the graduation message, which made the students conversant to the fact that this phase of life and their newfound freedom, after graduation, demands responsibility and maturity from them. The Chief Guest was then invited on the stage to give away the certificates and the trophies. Dr. Sally Enos motivated the students by saying that they are butterflies out of cocoon spreading their wings not only in India but also abroad. The message by Dr. Sally Enos in her speech moved everyone when she alluded to the ‘Chinese Bamboo Story’ to point out how the persisting and exerting efforts of parents and teachers bear fruits gradually in the success of students. The evening reached its highest point when the teachers and the graduating students opened their hearts, as they spoke of the cherishable moments spent. The speech by the all the students spoke volumes about the beautiful bond a child shares with his school and teachers. IB student, Shubankar, chose to share his success with his teachers especially with Ms. Sarla Narayan. He mentioned how Ms. Narayan’s one sentence, “Failure to prepare is preparation for failure”, changed his perception towards studies, life and goal setting. These special moments followed by the movie ‘Memories’, covering pictures of the students throughout their span in school overwhelmed everyone. However, the last item of awarding fun certificates brought a smile on everyone’s face. The magnificent event ended with a vote of thanks by Gautam Karve, but the celebrations continued with clicking pictures, cake cutting, appetizing dinner and smiles everywhere. 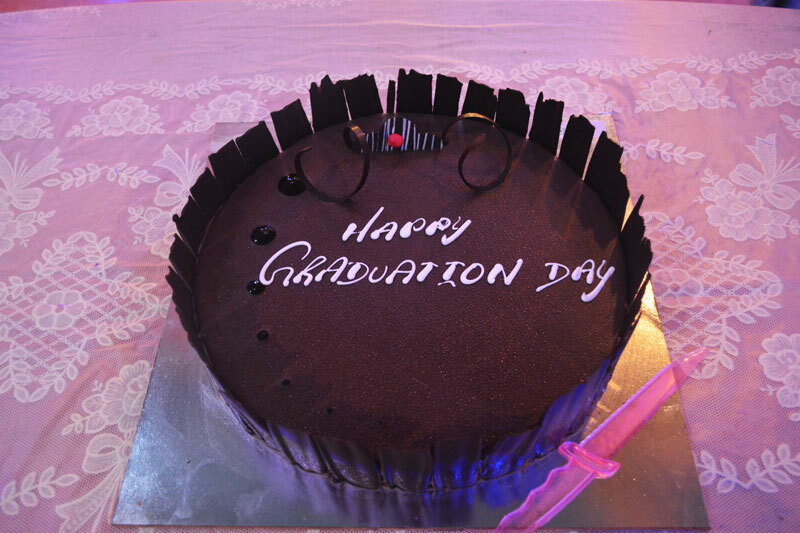 Dr. Pillai Global Academy celebrated the Graduation Day for its outgoing students of Grade 12 (Class of 2013) on the 18th August, 2013. The venue was the auditorium of the institution and the scheduled time for the commencement of the programme was 4.30 pm. The Chief Guest for the programme was Dr. Karuna Gupta an eminent educationist, heading the PG department of education at Pillai College of Education and Research, New Panvel. The programme began with the traditional lighting of the lamp by the Chief Guest Dr. Karuna along with the co-ordinators Mrs. Anjna Sahi, Mrs. Shraddha Sardesai and faculty member Mrs. Hema Vaidyanathan. The ceremony was declared open with a classical dance performed by Mrs. Shiny Jomon and Mrs. Mrinalini Kalita invoking the divine spirit. After this the graduating students of IBDP and A-levels made a grand entry amidst an enthusiastic applause from the audience. The welcome address was delivered by Mrs. Indu Parvathi, faculty member. Mrs. Anjna Sahi, Co-ordinator delivered the message to the outgoing students. The chief guest was then invited to the dais to give away the certificates and trophies. Ms. Gursharan read out the achievements of the students. Dr. Karuna Gupta’s speech, which was both enlightening and motivating was much appreciated by the students. Then the students were asked to share their experiences at the institution. Many of them were nostalgic and emotional as they profusely thanked their teachers. The last item of the day added a lighter touch to the programme. Fun titles and certificates were awarded to the students by Mrs. Anjna Sahi as Mrs. Hema Vaidyanathan explained why the teachers had bestowed the particular title to them. Ms. Shraddha Sardesai, proposed the vote of thanks. The programme drew to a close with a scrumptious high tea for students, parents and faculty. 6th July, 2012 was a very special day at DPGA, Panvel, as the IB results were declared. The students of IB (2011-2012) succeeded brilliantly with excellent scores. It was a 100% result which not only added a feather in the cap for the DPGA, Panvel, but also promised to act as a beacon for the upcoming batches. Miss Vidhi Mittal topped all her peers by securing 39 out of a total of 45 points. The Graduation Ceremony for the students was held on the evening of 21st July, 2012. On this day Dr. Pillai Global Academy sent out a cherished part of it into the wide world outside as its flag bearers. The Graduation Ceremony of the outgoing A level and IBDP batches was attended by a lively evening gathering comprising of a section of the students, parents and the school staff. The programme started with the lighting of the lamp by the Principal Mr. Derek Hamilton along with the IB and A level coordinators Ms. Anjna Sahi and Ms. Shradda Sardesai and the CAS coordinator Mrs. Beena Thampi. A unique prayer dance by the students Annie Ravi, Anuka ghosh and Archana Nair was a precursor to the joyful yet solemn event which was about to take place. A welcome song by Ms. Celine Xavier and Mr. Pravin Kulkarni followed. The welcome address was given by Mrs. Anjna Sahi. Mr. Derek Hamilton, Principal gave the convocation address in which he encouraged the students to live a life rich in quality and meaningfulness rather than pursuing superficial, materialistic considerations which would not offer contentment. The video which accompanied his speech illustrated this beautifully with a parable which posed the question whether the coffee we drink or the cup is more important. The students were called to the stage with a brief personal introduction given by our staff members Mrs. Shameem Mulla, Mrs. Hema Vaidyanathan and Mrs. Nirmala Krishnan. The presentation of certificates and awards to the outgoing students by the members of the school leadership followed. The students chose this occasion to speak about their school and the teachers who had taught them. Their heartfelt comments touched many a soul. The vote of thanks was given by Mrs. Indu Parvathi. A high tea and cake cutting followed the function. The evening ended in the hope that these academically bright, sprightly youngsters will make their mark in the world.